Alexandra Dillon is a native of Los Angeles. CA USA Her love of Old Master painting led her to study classical realism in Florence, Italy and then in New Orleans, LA, finally settling in Venice, CA. She has had work in group and solo shows across California, as well as the Appleton Museum of Art in Florida and the Italian Cultural Institute in San Francisco. 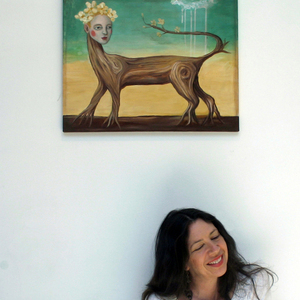 The paintings from her recent solo exhibition in Los Angeles examine the hidden world of the subconscious and are populated with surreal beasts and symbolic imagery. She continues to explore these themes in her current work.